8 different marking options for the Skunkmodel Works MQ-9 Reaper kit, including multiple USAF units, Royal Air Force and "Ikhana", an unarmed Reaper being used by NASA. CD 72004: Texas ANG 149th FW F-16C "Lone Star Gunfight ers"
Special 65th anniversary markings for San Antonio-based 149th Fighter Wing F-16C . The first sheet in our "Global Air Power" series covering lesser known air force s, this sheet provides two operational Pakistani Air Force marking options for t he Chinese/Pakistani JF-17 "Thunder" fighter aircraft. 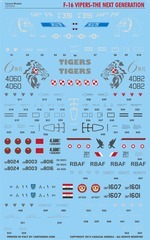 This decal sheet provides seven marking options for 1/72 F-5A kits, including a USAF "Skoshi Tiger" example from the Vietnam War, complete with m ission markings. Markings for F-102A of the Texas ANG(111 FIS), North Dakota ANG, Hawaii ANG, 509th FS and Turkish Air Force. 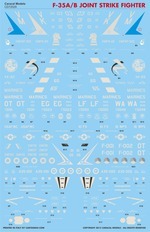 Designed for the new Meng F-102 kit. 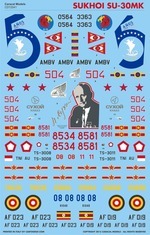 This decal sheet provides markings for Polish Air Force MiG-29's that were specially decorated to commemorate Polish WWII heroes in 2012. The three options include one MiG-29UB and two MiG-29s. 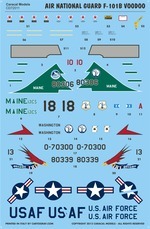 This decal sheet provides markings for Oregon, Washington and Maine Air National Guard F-101B units. 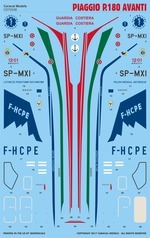 Colorful marking options for MiG-29s from Bangladesh, Bulgaria, India, Myanmar a nd Romania. 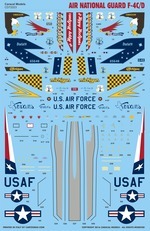 This decal sheet provides current markings for F-15C Eagles from Oregon, Montana and Massachusetts Air National Guard units. Multiple options for the French Air Force aerobatics team "Patrouille de France", including every special commemorative marking worn by the team since 1995. 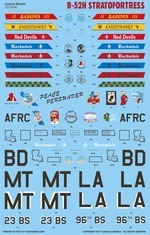 Five US Navy marking options for the PBM-5/PBM-5A Mariner patrol bomber, designed for the new Minicraft kit. 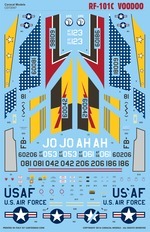 Accurate 1/72 markings for both YF-23 prototypes. 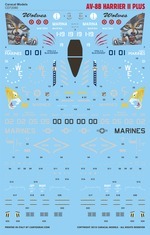 Multiple USMC marking options for the AV-8A Harrier, intended for the new Airfix kit. Eight overall ADC Gray T-33A options for Air National Guard units. Late-block F-16 markings for Minnesota ANG (new dark gray Have Glass Gen V scheme), Poland (Tiger Meet 2011), Morocco, Bahrain, Iraq and Oman. 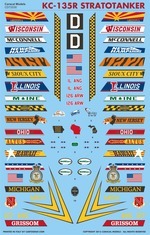 Markings for A-10C Warthogs from Arkansas, Idaho, Indiana and Michigan Air National Guard Units. 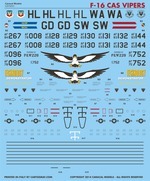 Designed for the new Hasegawa A-10C kit. Markings for two USAF Reserve EC-121s and two US Navy EC-121/WC-121s from VW-1 and VW-11. Designed for the Heller kit. Markings for two USAF EC-121s and two US Navy EC-121/WC-121s from VW-2 and VW-13. Designed for the Heller kit. Markings for overall ADC Gray Phantoms of the Minnesota, North Dakota, Oregon (both units) and Texas Air National Guard. 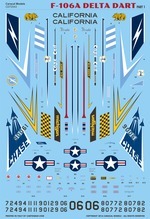 A 1/72 version of our best-selling B-58 Hustler sheet, with 19 different options for this iconic Mach 2 bomber. Designed for the Italeri kit. CD 72025: Brazilian Navy AF-1 (A-4M) Skyhawk "15 Years"
Markings for the spectacular special scheme to commemorate the 15th anniversary of Brazilian Navy's A-4M Skyhawk operations. 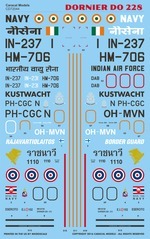 Also includes markings for a standard AF-1 and an twin-seater AF-1A in the regular scheme. 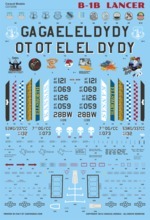 Designed for the Fujimi kit. 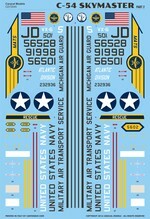 More US Navy marking options for the PBM-5/PBM-5A Mariner patrol bomber, designed for the new Minicraft kit. Accurate USAF marking options for the C-123B Provider transport. Designed for then Roden kit. 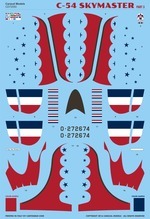 Multiple US Navy marking options for the Testors/Italeri 1/72 T-45 Goshawk kit. Options for F-35s of USAF, US Marine Corps, RAF, Royal Australian Air Force and Royal Netherlands Air Force. 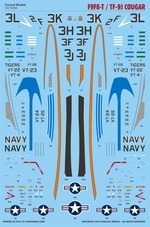 Designed for the Hasegawa and Fujimi kits. Marking options for KC-135R tankers from 16 USAF/ANG units. Markings for camouflaged F-16 Vipers involved in the CAS (close air support) eva luation program. 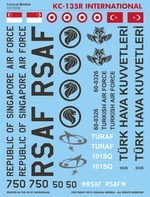 Markings for Turkish Air Force and Republic of Singapore Air Force KC-135R Stratotankers. CD 72033: F-16C "Florida Makos"
Markings for the 2013-2014 flagship F-16C of the 482FW "Makos" based at Homestead AFB. Eight marking options for the MQ-9 Reaper unmanned aerial vehicle, including Royal Air Force, French and Italian Air Force aircraft in addition to four USAF Reapers. Multiple marking options for the C-54/R5D transport aircraft. Designed for the new Revell kit. Five marking options for the futuristic P.180 Avanti turboprop utility aircraft. Designed for the Amodel kit. Multiple marking options for Be-12 anti-submarine warfare and Be-12P firefighting aircraft. Designed for the Modelsvit kit. 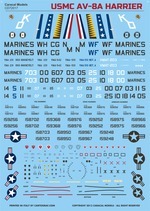 Multiple US Navy and French Navy (Aeronavale) marking options for the Hasegawa kit of the SP-5B (P5M-2) Marlin amphibian. Thirteen marking options covering all current operators of the Sukhoi Su-30MKK fighter/bomber : China, Indonesia, Russia, Uganda, Venezuela and Vietnam. 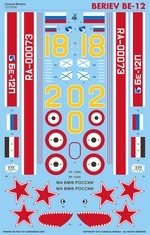 Designed for the Trumpeter Su-30MKK kit. Markings for the spectacular RAF "Battle of Britain" anniversary Typhoon FGR4 (ZK349). 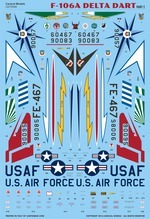 A total of five markings options for the F-106A Delta Dart in ANG/USAF service. Designed for the new Meng kit. Multiple military marking options for the Dornier Do 228 twin engine transport/utility aircraft. Designed for the Revell kit. More marking options for the C-54/R5D transport aircraft. Designed for the new Revell kit. Multiple military & civilian marking options for the DHC-6 Twin Otter twin engine transport/utility aircraft. Designed for the Revell (Matchbox) kit. Multiple USAF marking options for the RF-101C tactical reconnaissance aircraft. Designed for the Valom kit. 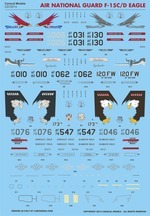 A total of five markings options for the F-106A Delta Dart in USAF service. Designed for the new Meng kit. Multiple marking options for the Fairchild C-119 transport. Markings for the C-54 Skymaster aircraft flown to support the USAF Thunderbirds aerobatic team. Designed for the Revell kit. Multiple marking options for the DHC-4 / C-7 Caribou in US Army / USAF service. Designed for the Hobbycraft kit. 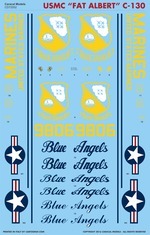 Markings for the USMC Blue Angels "Fat Albert" C-130 logistic support aircraft, both for the 1980s (A-4 Skyhawk era) and current versions. Designed for the Italeri kit. Multiple marking options for A-1E / AD-5 Skyraiders. Designed for the Monogram kit. 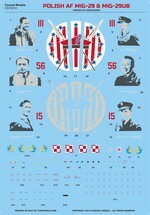 Post-war ANG P-51D marking options from 5 different units. 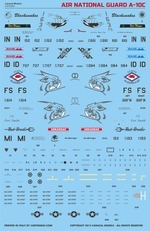 Designed for the Tamiya and Airfix kits. Eight marking options for the P2V Neptune patrol aircraft. Designed for the Hasegawa kit. 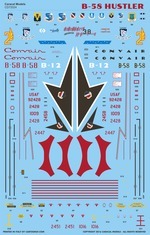 Seven marking options for current/recent USAF B-1B strategic long range bombers; each with colorful nose art. Designed for the Monogram kit. SOLD OUT! More marking options for the P2V Neptune patrol aircraft. Designed for the Hasegawa kit. Eleven marking options for USAF B-52H Stratofortress strategic long range bombers. Designed for the AMT/Italeri kit. CD 72059: US Navy F9F8-T / TF-9J "Twogar"
Multiple marking options for US Navy's F9F8-T two-seat Cougars. Designed for the Sword kit. CD 72060: USAF F-16C/D "Dark Vipers"
Five markings options for USAF F-16C/D in the latest, darker Have Glass V scheme. Multiple marking options for the CASA C-212 Aviocar light transport. Designed for the Special Hobby kit. CD 72062: USAF C-130H "Guard Herks"
Marking options for C-130H Hercules tactical transport aircraft from 12 different Air National Guard units. Multiple marking options for current/recentUSAF F-15E Strike Eagles. Multiple Vietnam War options for USAF F-104C Starfighters. Includes markings for Puerto Rico ANG, where some of these F-104s went after the war. CD 72065: U-2A/C "Dragon Lady"
Ten marking options for early U-2 spyplanes. More marking options for KC-135R tankers from USAF/ANG units. 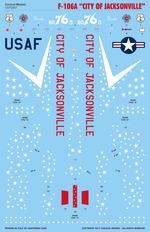 CD 72067: F-106A "City of Jacksonville"
Markings for "City of Jacksonville", the Florida ANG F-106A with Bicentennial markings worn during 1976. 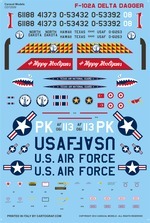 Multiple marking options for USAF B-45 Tornado Cold War jet bombers. Designed for the Valom kit. Multiple marking options for USAF RB-45 Tornado Cold War reconnaissance jets. Designed for the Valom kit. 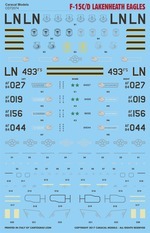 A comprehensive 1/72 scale sheet for general markings (national insignia, stencilling) of C-135 family of aircraft. 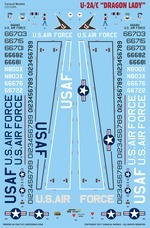 Eleven marking options for USAF F-100D/F Super Sabres in the Vietnam War. 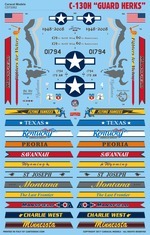 Multiple options for post-war USAF T-6G and SNJ Texans. Multiple options for Sikorsky H-34 / UH-34 helicopters from USAF, USN and USMC units. Multiple options for Lakenheath-based USAFE F-15C/D Eagles, including several Mig killers. Four USN marking options for FJ-3 Fury early jet fighters. Designed for the Sword kits. SAC-era markings for B-52G/H. Designed for the AMT/Italeri kits. Post-WWII USN markings for PB4Y-2 Privateer. Designed for the Matchbox kit. Military and civilian marking options for post-war British light transport. Designed for the AModel kit. Multiple marking options for AV-8B Harrier II Plus of US Marine Corps and Italian Navy. Multiple marking options for USAF RF-84F Thunderflash recon jets. Designed for the Sword kit. CD 72086: F-105F/G "Wild Weasels"
Multiple marking options for USAF F-105F/G Wild Weasel SAM suppression aircraft. Multiple marking options for prototype and early service F-15 Eagles. 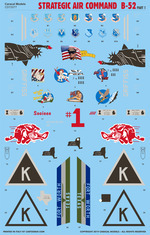 A comprehensive set for USAF SR-71 & YF-12 markings. 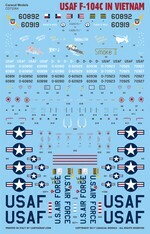 A comprehensive set for NASA and USAF SR-71 & YF-12 markings. 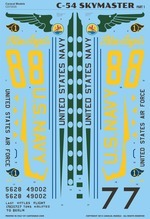 Markings for US Navy P-3 Orion patrol/ASW aircraft. Multiple marking options for USAF B-47/RB-47 Stratojets.